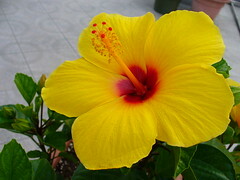 The Hawaiian Hibiscus is the state flower of the islands of Hawaii. They come in a vivid shade of yellow and can be up to six inches across. The different members of the hibiscus family all develop attractive flowers which are adored by bees and butterflies. A number of folks even brew a tea out of one particular type of hibscus.